The Junior jiu-Jitsu IBF England syllabus starts at 7th Kyu and is well structured with the junior student in mind. The more dangerous and difficult Jiu-Jitsu techniques have been omitted for safety reasons and enables the child to develop their skills and confidence in a safe environment and with regular grading opportunities. All Jiu-Jitsu IBF England Instructors are enhanced CRB checked, Coach/Teaching qualified, First Aiders and members of their local Sports Councils. 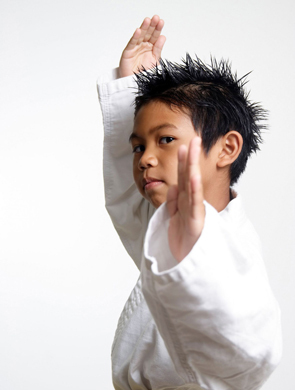 Junior Jiu-Jitsu IBF England has introduced safety weapons within its Kobudo Syllabus thus enabling Junior students to learn traditional Kata in safe and exciting way. Children and young people training with the Junior Jiu-Jitsu IBF will build confidence and self discipline while also learning a worthwhile Self-Defence. Upon reaching their Black & White Stripe Belt, if a young person is under 16 and not able to progress onto the adult syllabus we encourage them to learn the Kobudo Syllabus Katas which is part of their continual personal development Jiu-Jitsu/Kobudo. This training is supervised by a senior Instructor/Coach using safety weapons made of Foam/wood etc. This helps develop their skills for further progression rather than taking gradings that do not mean anything or not enhancing their development within Martial Arts. Further advice is given on request.